Gondolas in Venice Part of the World Heritage? Plastic gondolas are a threat. The Venice Gondola Association believes that it is a shame if synthetic versions will replace the wooden gondola's. Mainly because they are essential for their cityscape, it is disrespect for this wooden heritage, and it takes months to make a wooden gondola. And to be an owner of a gondola goes from generation to generation in one family. I mean can you imagine a picture of Venice without a traditional authentic Venice gondola? A romantic gondola tour for many is still a highlight during a visit to Venice. The City Council decided in 2009 that the wooden stick which accompanies the gondola, not to replace by a plastic version. "The traditional and protected gondolas and the materials are essential to ensure Venetian gondola's continue to exist," said Aldo Reato, chairman of the Venice Gondola Association. If the gondola will be on the World Heritage list, it is illegal to change something on its traditional Venice design. Venice is also trying to put its famous carnival on the sublist. The campaign to ensure this starts soon. In the 16th century, there were about 10,300 gondolas in Venice. Today there are only 400 active. 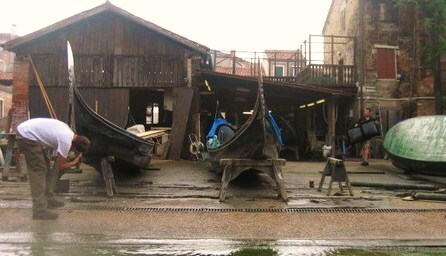 The winter season is typically used to maintain the gondolas in the first gondola yards. Some gondoliers are members of cooperatives. These are the; Venetian Gondoliers' Cooperative "Daniele Manin." Please explore my site more about the Venetian Gondola and the different topics.